Enjoy fun activities with the elephants such as a mud spa session and a river shower! really great experience ! feeding elephants playing water with them and even scrubbing their backs! 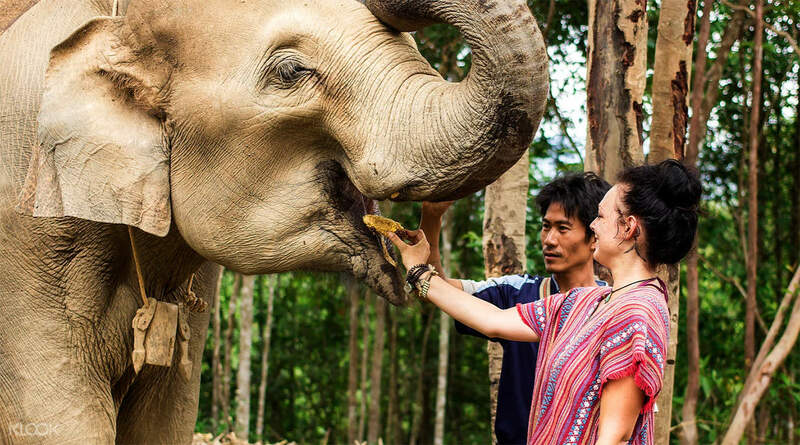 The elephants of Thailand are famous all over the world, and there's no better way to truly have a memorable experience with these gentle giants than a visit to the Elephant Jungle Sanctuary in Chiang Mai. Famous for their ethical, no-riding method of giving visitors an experience with these gentle giants, visitors will be able to make unforgettable memories of being a part of their lives. Upon arriving at the sanctuary, visitors are greeted with refreshments and valuable information about the elephants' dietary habits and the good work that the sanctuary does. Visitors will don traditional Karen tribe clothing as their day with the elephants begin, and be able to assist in preparing the elephants' food and feeding it to them. Guests are free to play, interact, and take photos with these elephants, all while being able to learn about how they had come to the sanctuary, their rescue story, and how more elephants could be protected from abusive practices. Fancy some good clean fun? How about a mud spa with the elephants? You'll get to jump in with them and then bathe them in the river afterwards to get them nice and clean. If you like having more time with the elephants, you can opt for the One Day Walk which will let you visit more camps and meet more elephants to spend time with! After a good meal, you'll be easily and safely conveyed back to your hotel, knowing that you have had a truly safe and ethical experience and have contributed to making a difference in the elephants' lives. 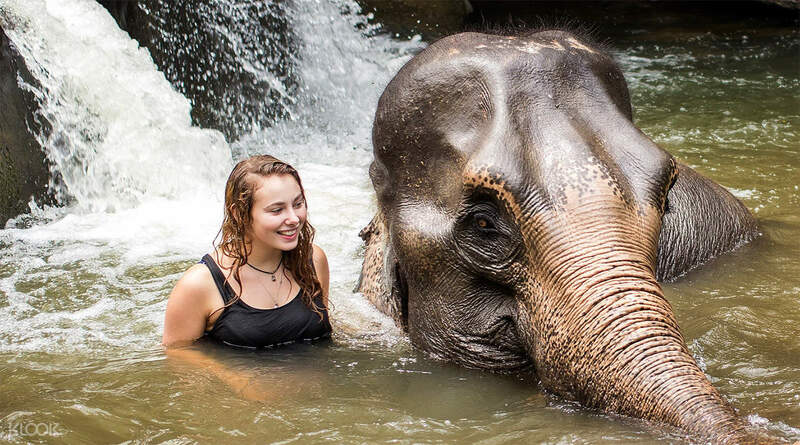 Have a mud spa with the elephants! Wow what an amazing experience! Everything was perfect from start to finish. The staff were so welcoming and funny. You can tell the elephants are cared for properly. We went during the songkran festival so driving back was fun as we were soaked from the water the locals were throwing at us! Definitely recommend!! Wow what an amazing experience! Everything was perfect from start to finish. The staff were so welcoming and funny. You can tell the elephants are cared for properly. We went during the songkran festival so driving back was fun as we were soaked from the water the locals were throwing at us! Definitely recommend!! Best activity so far!! If visiting in Thailand the elephant sanctuary is a must. Such a beautiful experience to be able to care for these creatures while learning all about them and enjoying nature surrounding the area. Kids absolutely loved it!! Best activity so far!! If visiting in Thailand the elephant sanctuary is a must. Such a beautiful experience to be able to care for these creatures while learning all about them and enjoying nature surrounding the area. Kids absolutely loved it!! The ride was long. But it was a fun trip. We went for half a day. Learnt so much about elephants. We got to feed them. Bathe them and have our late lunch before we head back to the city. Overall it was a good experience. The ride was long. But it was a fun trip. We went for half a day. Learnt so much about elephants. We got to feed them. Bathe them and have our late lunch before we head back to the city. Overall it was a good experience. Awesome experience overall,the people running the show at camp 5 are a delight, fun and full of life. You can clearly see that they care for the animals and make sure they are taken care of at all times.if in Chiang Mai do not miss this experience !!! Awesome experience overall,the people running the show at camp 5 are a delight, fun and full of life. You can clearly see that they care for the animals and make sure they are taken care of at all times.if in Chiang Mai do not miss this experience !!! We have great fun with the elephants! & happy to see them playing in the nature without anyone riding on them! There was also a photographer who helped take photos to us, & we can download all photos from Dropbox free of charge! We have great fun with the elephants! & happy to see them playing in the nature without anyone riding on them! There was also a photographer who helped take photos to us, & we can download all photos from Dropbox free of charge! Absolutely a must have experience when you are in Chiang mai! we did a lot of research before selecting this tour - we didn't want see elephants performing tricks or ride on them, we just wanted to them as they are in the mountains. we saw exactly that! we joined in with their daily routines like feeding and bathing, but otherwise the elephants could do whatever they wanted to. Some say that the people looking after the elephants are trainers but then without them, we would be able to get near the elephants. All elephants were treated very well and seem to be very happy there. we had a fantastic time there and would recommend this tour! Absolutely a must have experience when you are in Chiang mai! we did a lot of research before selecting this tour - we didn't want see elephants performing tricks or ride on them, we just wanted to them as they are in the mountains. we saw exactly that! we joined in with their daily routines like feeding and bathing, but otherwise the elephants could do whatever they wanted to. Some say that the people looking after the elephants are trainers but then without them, we would be able to get near the elephants. All elephants were treated very well and seem to be very happy there. we had a fantastic time there and would recommend this tour! highly recommend! It's a amazing experience for me to be with elephants and the beautiful nature. Although it takes a long ride to the sanctuary but it's very worth. The staffs in sanctuary take very good care to elephants. The guide speaks very good english and teach us a lot about how to take care elephant. Going there is just like a retreat from the city life to experience a sense of peace & harmony. highly recommend! It's a amazing experience for me to be with elephants and the beautiful nature. Although it takes a long ride to the sanctuary but it's very worth. The staffs in sanctuary take very good care to elephants. The guide speaks very good english and teach us a lot about how to take care elephant. Going there is just like a retreat from the city life to experience a sense of peace & harmony.